Moen has been on the market for a very long time marketing a unique and excellent line of faucets and other fixtures for bathroom, kitchen, and outdoor purposes. 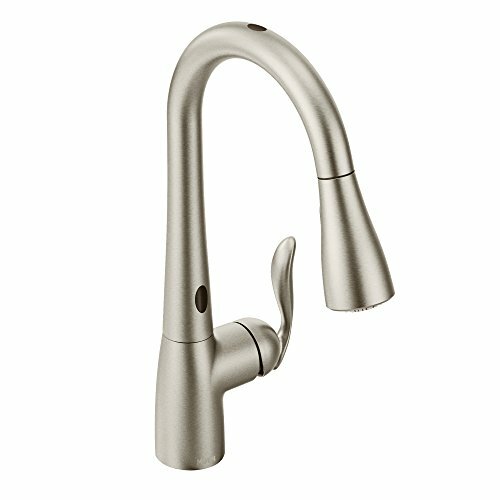 The Moen 7594ESRS is one of the best and expensive hands-free kitchen faucet available on the market today. In the beginning, kitchen faucets were all about the color, design, and the style they came in, but with technology advancing these days people are more eager to get themselves the latest technology. This kitchen faucet is one such fixture that might worth laying your hands on. With a stainless and fingerprint resistant body, the Moen kitchen faucets have already acquired a reputation for marketing the best kitchen faucets. The Moen 7594ESRS holds the record as one of the high-tech kitchen faucet systems that requires only less than an hour to unpack, install, and put into use. The product comes with an active reflex system in its spray head that will provide the user full control over its flow. One of the most attractive things about this product is that it comes incorporated with the latest MotionSense hands-free operation feature that comes with enhanced senses that allows it to function seamlessly. The MotionSense system incorporated into this kitchen makes the faucet efficient enough to activate the flow in just simple and smooth hand gestures. When it comes to automatic kitchen faucets: there are plenty of models on the market today, but the Moen 7594ESRS is not like something most of the brands market. This product comes in a unique design that allows it to be installed through one or three holes. One of the notable things about the Moen 7594ESRS kitchen faucet is that it is completely spot resistant and rust resistant. The product comes in different color and finishing variants, chrome, matte black, oil rubbed bronze, and stainless steel. Now, the biggest highlight that we really love is that the Moen 7594ESRS is that it comes in three variants, single sensor, dual sensor, and standard no sensor model. Therefore, there goes one of the unique variants provided by one of the top brands on the market today. However, this is not the only feature that we liked the most; the main feature that we liked was that this product comes with two sensing zones that allow the user to activate the faucet flow in two ways. One of the sensors is placed at the base of the faucet and the other placed at the top of the faucet. So, all you have to do is simply wave the hands near to the top of the faucet or near the base of the faucet. Move the hands away and water flow stops. Yet another feature that makes this kitchen faucet is unique is that it comes with a pull out feature. Yes, a spray head that could be pulled out of the faucet set up, this sprayer head is attached to a 68-inch long hose, which, in turn, allows the user to clean sides of the sink and even outside the sink. The kitchen faucet is equipped with the option to select from two types of flow, stream flow and spray mode. Another important thing about this kitchen faucet is that the variant with sensors incorporated come with 5-year warranty on its digital components and on the hand, for the standard without sensor incorporated variant the manufacturer offers a lifetime warranty on the product. This automatic kitchen faucet also comes with a power clean spray technology incorporated that enhances the spray power of the faucet up to 50 percentages high. When it comes to automatic kitchen faucets, there are confusions about the temperature control. To know this you will have to know that there are two types of control boxes. A gray box or a black box, the gray box allows the user to change the temperature for the sensor through the box itself. However, the gray box is considered old and is no longer in use, but the Moen 7594ESRS comes with a black box that demands the user to use the handle if he/she needs to change the temperature of the water flow. Sensors work on electricity if you find the faucet draining the batteries frequently, then consider switching off any one of the sensors and then use the faucet. Unlike most of the automatic kitchen faucets out there, this faucet comes with some new gestures that turn on the water flow and turns of the flow. Place the hands in front of the sensor and move it to turn on the flow and if you need to turn off the flow, just move the hands away or stop moving your hands in front of the sensor. Unless and until the sensor finds you hands moving it will not turn on the flow. You would be surprised to know that, the Moen 7594ESRS automatic kitchen faucet does not have any real competitor on the market today. Yes, for the price, the quality, and the design no other brand or model of kitchen faucet can match this product. Surprised right, we have compared almost every automatic kitchen faucet out there, none of them are close to what this faucet delivers. However, we found one competitor to its model that comes without the sensors (Moen 7594ESRS standard). The KOHLER K 99261 CP model comes at the same price and similar looks, however, in terms of the quality these two products are neck to neck. If you are not looking for a sensor incorporated product and if you want some good features in your kitchen faucet, then KOHLER K 99261 CP could be a good option for you as it comes with a braided hose that is easy to use and spray functions designed specifically for cleaning fruits and vegetables. When it comes down to the price of this product, we find it quite reasonable for the features and quality it delivers. However, if you are waiting to get this product while there is a price drop, we do not think that something like that will happen with the sensor-incorporated models. The price of the motion sensor incorporated model has been steady since its launch; on the other hand, the price of the standard model has dropped more than once. If you ask us why this product is recommended, then our answer is simple. Hands free kitchen faucets are the future and there is nothing better than the technology and style today. Yet another reason is the warranty, the faucet requires six AAA batteries that could power the product for a comparatively longer time than other models, and the sensors incorporated into this product is excellent. Yes, the sensors incorporated, as of now, we have heard no grievances from the customers. With the product coming with an expensive price tag if you are opting to purchase the standard version, we quote that you would be cheating yourself. If you think the product is complicated, we would like to tell you the product comes with a manual that could troubleshoot you.